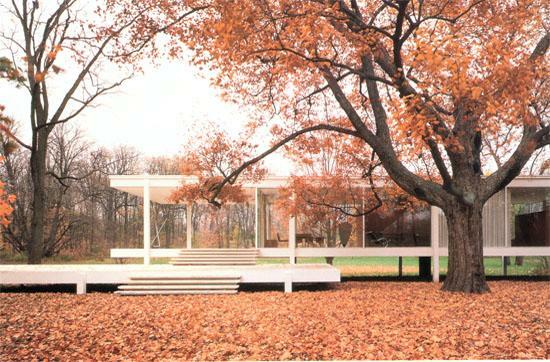 Designed by Mies van der Rohe and built from 1946 to 1951, Farnsworth House is considered a paradigm of international style architecture in America. The house's structure consists of precast concrete floor and roof slabs supported by a carefully crafted steel skeleton frame of beams, girders and columns. Designed by Mies van der Rohe and built from 1946 to 1951, Farnsworth House is considered a paradigm of international style architecture in America. The house's structure consists of precast concrete floor and roof slabs supported by a carefully crafted steel skeleton frame of beams, girders and columns. The facade is made of single panes of glass spanning from floor to ceiling, fastened to the structural system by steel mullions. The building is heated by radiant coils set in the concrete floor; natural cross ventilation and the shade of nearby trees provide minimal cooling. Though it proved difficult to live in, the Farnsworth House's elegant simplicity is still regarded as an important accomplishment of the international style.